While you may have an aspiring Maya Angelou or the next Stephen King in your classroom, writing doesn’t always come naturally to every student. As educators, we know that inspiring students is essential to improving their writing skills. One way to inspire and motivate your students is to have them make connections to ideas and themes in films. Let’s face it, most students (and adults, for that matter) enjoy watching movies. 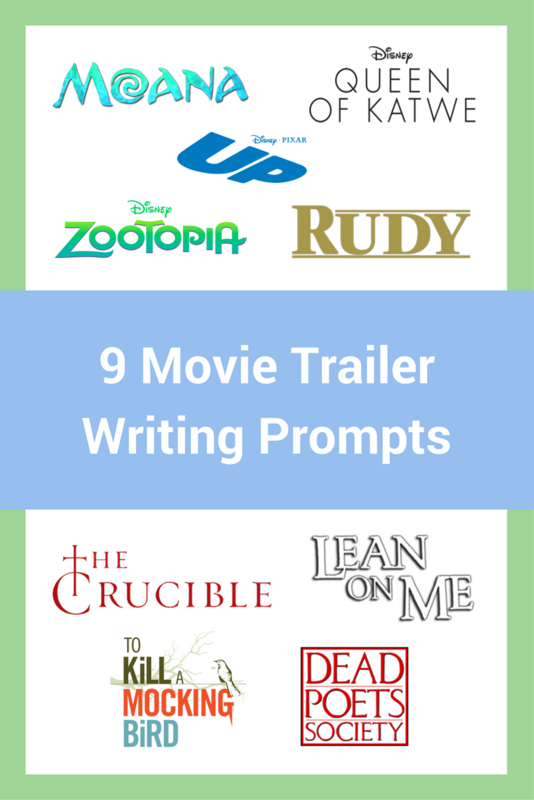 Having students watch a movie and write on a prompt based on the film is an excellent way to make the writing process more engaging for your students. As such, we’ve created nine writing prompts, separated by school level, that you can use to get your students’ creative juices flowing. This 2016 release is set in a city called Zootopia where animals of all kinds live and work together. A rookie officer, a bunny named Judy Hopps, tries to prove herself as she is the first bunny to join the police force. While she and her partner, a veteran fox, are on a case to find a missing animal, they learn things are more complicated than they expected. Themes throughout the movie include stereotypes, not everything is as it seems, fear, and not giving up. Writing Prompt: Have you ever been in a situation where things were not as you expected? How were you able to deal with the situation? As you look back, are you happy with how you handled the situation? In the opening montage of Up, Carl and Ellie meet and marry. They both dream of exploring Paradise Falls, but this dream goes unrealized when Ellie passes away and Carl is left alone. Eventually, he goes to Paradise Falls in his house (attached to hundreds of helium balloons so that the house can fly) along with Russell, a young wilderness explorer scout. The trip is more adventurous than Carl could have imagined. The movie's themes include aging and friendship. Writing Prompt: Have you ever become friends with someone who you did not expect? What made you become friends? The title character, Moana, is the daughter of a Polynesian chief. She longs to see the world beyond the island she lives on while her father wants her to stay–she is meant to succeed him as leader of the island. Moana goes against her father’s wishes and leaves the island after her people are endangered in an attempt to save them. The movie's themes include personal development, heroism, and empowerment. Writing Prompt: Did you ever go on a trip or do something that changed you in some way? Why do you think you were changed? How did you change? In this 2016 release, which is based on a true story, Phiona is a ten-year-old who lives in impoverished conditions in Uganda. After learning how to play chess from a missionary named Robert, she becomes totally taken by the game and develops into a top player. Phiona plays in tournaments, some of which are outside of Uganda, where she realizes the world has greater opportunities that those at home. Phiona longs to provide for her mother, siblings, and herself. The themes include perseverance, the ability to rise up, teamwork, and humility. Writing Prompt: What is your favorite hobby or way to spend time? What makes you enjoy the hobby? How has engaging in that hobby impacted you? Based on a true story, this 1993 movie tells the story of Rudy Ruettiger who dreams of playing football at Notre Dame. Unfortunately, Rudy has neither the grades nor money to attend Notre Dame and is not especially gifted athletically. Nonetheless, Rudy is determined to escape the steel mill town he grew up in and will do anything he can to realize his dream. Themes of this movie include perseverance, fighting for your dreams, and goal setting. Writing Prompt: Have you ever set and achieved a goal? What inspired you to accomplish your goal? How did you feel once you accomplished your goal? Based on the classic book, To Kill a Mockingbird tells the story of a white lawyer, Atticus Finch, who defends a black man, Tom Robinson, accused of taking advantage of a white woman. The 1930s Southern town is convinced of Tom's guilt due to his skin color. However, Atticus does not agree and fights for his client. The story is told through the eyes of Atticus's daughter, Scout, who learns some unpleasant truths about her neighbors and life. The themes include racism, judgment, injustice, and lost innocence. Writing Prompt: Have you ever judged without knowing all the facts? What prompted you make the judgment? How did your view change once you had all the facts? This 1989 movie is based on a true story. A Paterson, New Jersey High school is failing miserably, so the superintendent turns to a former teacher of the school, Joe Clark, who is considered a maverick, to be the new principal. Clark imposes strict measures to rid the school of drugs and gangs while pushing teachers and students to do better. While his actions are not initially well received, he ultimately gains their respect as his measures show results. Themes of the movie include tough love, dedication, the importance of education, and the importance of leadership. Writing Prompt: Which coach or teacher has had the biggest impact on your success? Why do you think you were able to achieve success? Do you think you would have still been successful if you had a different type of leader? Based on the Arthur Miller play, the 1996 movie version of The Crucible follows the play faithfully. Set in 1600s New England, this film is based on the Salem Witch Trials and the hysteria that swept through the town of Salem, Massachusetts. People accused others of being witches, and many were convicted and hung with little evidence. The movie focuses on a young woman, Abigail, who had a romance with a married man and is determined to get him back. The themes of the film include intolerance, redemption, and reputation. Writing Prompt: Did you ever follow the crowd and act without thinking? What were the repercussions of your action? As you look back on your actions, how do you feel about them? The movie is set in an all-boys prep school in 1950s New England. A new English teacher, John Keating, arrives at the school. Keating is dramatic and encourages the students to seize the day and make the most of life. His ways contradict the button down mentality of the school. The boys, however, appreciate Keating and form a poetry society. They grow and develop in a manner that is not necessarily appreciated by the conservative community around them, causing issues for the boys and Keating. Themes of the movie include the power of poetry/literature, rebellion, and passion. Writing Prompt: Did you ever follow a passion even when others did not approve? What gave you the courage to move forward? How did following that passion impact you as time went by? Nearly any movie can be paired with a writing prompt that can inspire even the most reluctant of students. There are plenty of movies that are appropriate for watching in school. Try one of the movies above or find another movie and get your students writing!